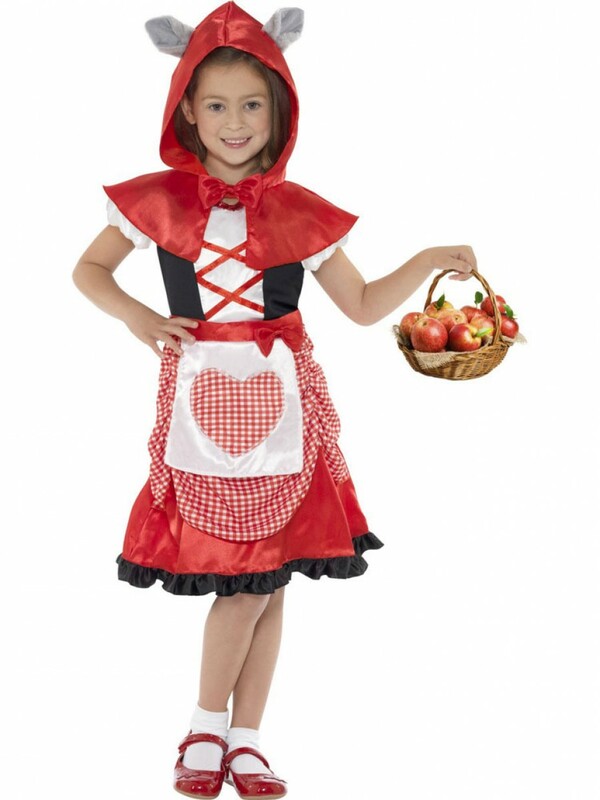 This super cute Miss Hood Costume is a fun twist on a classic Fairytale look with a detailed Dress plus Hooded Cape with Wolf Ears for a fun twist! This lovely Miss Hood Costume is an ideal choice for Book Week, a Fairytale theme or just fun for dressing up on any occasion. The outfit includes a Dress and hooded Cape. The Dress has loads of detailing including a corset style top, ruched apron design with heart front, bow detailing and a satin skirt in bright red with black trim. All of this detail really creates a fantastic look. The coordinating satin cape has a matching bow detail to the dress and is in a classic bright red. For a little bit of extra fun, the hood of the cape has attached wolf ears - a great twist on this classic look. This Little Miss Hood Costume is bound to bring delight to any girly girl and is a great choice for a modern take on a classic tale!